The Wild Kratts have a kind and positive message about all animals: that no matter how horrifying a critter may look to us, it’s beautiful for what it is. As hard as this may be, we try to take their advice. Take the naked mole rat, for example. Now, before the Wild Kratts, we would have turned our nose up at the wrinkly pink thing, but now we understand it’s only naked because stores don’t stock pants in rats’ sizes. It’s just not their fault. Or consider the purple pig nosed frog. It doesn’t necessarily want to look as silly as it does, but with a name like that it probably couldn’t help just giving up on itself. You see? We’ve really matured in our thinking! The other thing the Wild Kratts do that we like is have super powers. They’re able to borrow the powers from any animal including turkeys, zebras, walruses, and even blue jays of all things. When the brothers wear their bat suits they get the powers of flight (always useful), echolocation, and bat claws. Thanks to them we understand now that bats aren’t terrifying flying devils that want to build nests in our hair. They just want to eat mosquitos, an animal we refuse to excuse no matter how kind we’re feeling. We just have no time for mosquitoes. Bats, please eat all the mosquitoes. 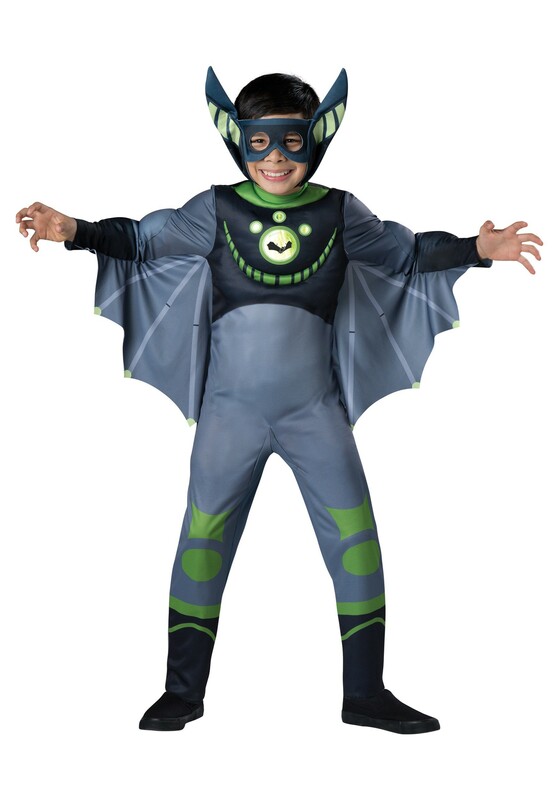 Our Wild Kratts Green Bat Costume has built in wings for flying and a big nocturnal friendly grin across the chest. It’s reflective, which is always good for when you’re out at night. The costume is easy to put on thanks to its velcro fasteners, and the big-eared bat mask is a comfortable fit for maximum bat-related fun!